Why do you want Jesus Christ to return? Dr. Reagan: The sixth reason why we as Christians should all be yearning for the coming of the Lord has to do with the promises that God is going to fulfill regarding the Church. What are those? 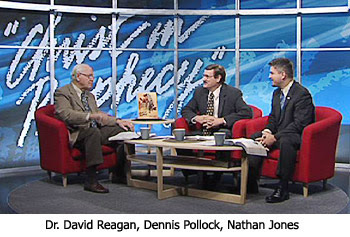 Dennis Pollock: He has promised us eternal life, that we would reign with Christ on the earth, and ultimately that we would reign with Christ forever. God always keeps His promises, so when Christ returns we are going to be given an area to reign with Jesus Christ. Dr. Reagan: Are you going to be a mayor, or governor, or what? Dr. Reagan: You know that God said there is going to be some of the degree of reward based upon our works in the kingdom now, and that some during the Millennial Kingdom would be put over one city, and one over two, and one over five or whatever number. Dennis Pollock: Yes, the Master said in Matthew 25, "You have been faithful in a few things, I will make you ruler over many things." Now, a lot of people think Heaven is where you play the harp, you sit on a cloud, and if you're lucky someone comes over to your cloud and enjoys a little harp time in a duet with you. But, the Bible does not say we will play harps forever, and doesn't say we will sing forever either. It says we will reign with Jesus Christ forever. Dr. Reagan: One of the things I'm really looking forward to is the promise to the Church that we are going to receive glorified bodies. I'm ready for mine, I really am! My left knee hurts every time I take a step from arthritis and all that sort of thing. I'm just looking for that day when there's not going to be any of those pains and I have a glorified body. I can hardly wait! The Lord has made so many, many wonderful promises to both Israel and to the Church. We don't need to claim their promises, and they don't need to claim ours. He is going to fulfill all of these promises. Dennis Pollock: God's gotten very specific about those promises, too. When you look at Revelation, John describes this New Jerusalem that will be our home for all of eternity. He gives all kinds of details about it. We know it'll be made of a transparent gold. We know there will be gems. The gates will be made of pearls. We actually know the dimensions of it which is around 1,500 square miles and then 1,500 miles high. These are truths. This is God saying to His people, "Hang in there! You may not be doing too well right now. You may be living in some little shack, but I have something amazing for you and I am going to give it to you." And, God always keeps His Word. Dr. Reagan: Praise the Lord! Dr. Reagan: Do you have any personal reasons why you are desiring the Lord's return in this year? Nathan Jones: Well, for me, it hits rather close to home. My elementary age son Zachary has autism. He still can't talk. He will never be able to do the things a normal boy does. He will grow up and be a kid in an adult's body, as there is no cure for autism. Concerning the promise of having a glorified body, I know when I go up to Heaven one day that my son Zachary will be whole again, and the whole of the millions of people in Heaven will be celebrating and glorifying God for that transformation. That's the day I live for! Dennis Pollock: For me there are so many reasons, but there's this one reason I sometimes think of that might be a little unusual. When you are born again your love for Jesus is so strong and there is a euphoria and you just feel like all you want to do is live in His presence, but then you come down to earth and you find you still have this nature that wants to say the wrong thing, do the wrong thing, and wants the wrong thing. You realize there are these two natures in you at war with one another, and so you never feel quite comfortable no matter how spiritual you can get. I've sometimes been in the most anointed spiritual states and yet suddenly the flesh will just put a thought in my mind or an urge and I will think, "Where did that even come from?" But, when Christ comes and gives us our new bodies, He is going to do an extraction. He is going to take out that sin nature so that we are going to serve Him in purity without that ugly sinful nature that we have. Dr. Reagan: I agree. I have a grandson who is afflicted. He just doesn't know who he is or who I am. You can't hold him. You can't touch him. He can't even have a haircut without being put to sleep. I dedicated two books to him because he is a constant reminder to me that we live in a fallen world where the innocent suffer. I look forward to that day when Jason will be able to talk with me, I'll be able to throw a football to him, and we will be able to have fellowship with one another. That's going to happen when the Lord Jesus Christ comes back. I'm also looking forward to a reunion with family members and church members who have gone on before me. Concerning Bible characters, I can hardly wait to meet David, and to see David lead a worship service. Boy, that will be something! Or, can you imagine sitting in a Bible study where John is teaching the Book of John? Oh, there are so many wonderful things that I look forward to! Dr. Reagan: The Bible says in 1 Corinthians 15, "Oh, death, where is your victory? Oh, death, where is your sting?" Only a Christian can look death in the face and sneer at it with such words, and that's because our Savior Jesus has conquered death. He has promised that those who put their faith in Him will also overcome death. Here is how He put it in John 11:25, He said, "I am the resurrection and the life, he who believes in me shall live even if he dies." You can be assured of eternal life. Dennis Pollock: All the religions of the world except Christianity teach that you must earn your salvation through good works. Only Christianity teaches that salvation through good works is impossible. Sinners cannot justify themselves to a perfect and holy God. Jesus was sinless. He died in our place as an atonement for our sins. All you have to do to receive that atonement is to place your faith in Jesus as your Lord and Savior. Nathan Jones: You can do that by praying a simple prayer, confessing to God that you are a sinner and that you are sorry for your sins, and that you desire to receive Jesus as your Savior. Salvation is a free gift of God through faith in Jesus. It's not something you can earn. Dennis Pollock: If you decide to accept Jesus as your Lord and Savior, let me urge you to seek out a Bible believing church where you can make a public profession of your faith in Jesus. Submit yourself to water baptism and start growing in the faith. Nathan Jones: You will now have claimed those wonderful promises of God. Dr reagan and nathan.... how i admire ur strong faith and assured hope for the wholeness of ur loved ones. Im so proud of being Christian. We have the truth of eternal life to keep us positive and focused on Jesus. GOD bless u. Thank you for those encouraging words, Susie! So good to hear we could be a blessing to you. You all are a great blessing to us as well.